My mini bar pan arrived yesterday, and I didn’t waste any time putting it to use. 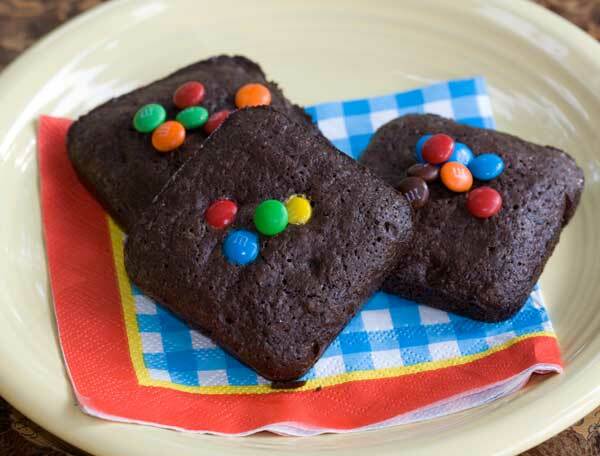 The first item on the agenda was a batch of square shaped Mini Bar Pan Brownies. Aren’t they cute? While I’ve never been an “edge” person when it comes to brownies (I do like the edges of cookies, though), I enjoyed these despite the fact they do give you more edge per bite. Or maybe the brownies are just moist to begin with and it’s not an issue. This super easy brownie recipe worked really well in the mini bar pan, plus using the pan knocked about 20 minutes off the total bake-time. Not that time is a huge issue right now, but if you have a bunch of hungry brownie-loving kids around, it might be. Plus I like the built-in portion control. I’ve never been very good at cutting pieces evenly, so problem solved. Brownies made in a mini bar pan. Preheat oven to 350 degrees. Spray a 12 indentation mini bar/dessert pan with baking spray. Melt butter in a large saucepan set over medium heat. When melted, remove from heat and add chocolate chips. Stir until melted, then stir in the cocoa powder and sugar. Set aside and let cool to lukewarm. When the chocolate/butter mixture has gone from hot to warm, stir in the cold eggs and vanilla. Add the flour mixture and stir to combine, then stir in the walnuts. Make sure the batter is cool, then add chocolate chips if using. Pour batter into prepared baking pan and bake 16-18 or until brownies appear set. Let cool in the pan for about 15 minutes, then use a knife to carefully dislodge the bars from the pan. To toast the small amount of walnuts quickly, use the saucepan you'll be using for the brownie batter. Heat it over medium high, add the walnuts to the dry pan, and toast in the dry pan, moving the walnuts around with a wooden spoon to keep them from burning. When nuts appear shiny, remove them from the saucepan to cool. They nuts will toast faster if you chop them first. For the pan, I used the Calphalon Classic Nonstick Bakeware 12-c. Dessert Bar Pan. I’ve noticed the mini bar pan I bought is becoming harder to find, however, Amazon sells a Wilton 4 Nonstick Brownie Pan, 12-Cavity that’s very similar. Those are super cute! The description makes them sound worth trying even if you dont have the pan. I am a pure vegetarian. Is there a substitute for eggs in the above recipe?